Prior to being chosen governor, John White accompanied a 1585 expedition to what was then known as Virginia. There he produced a series of drawings and watercolors of the everyday life of local Native Americans. Theodor de Bry later engraved these scenes from White’s renderings. White also compiled the above map of the North Carolina coast, which was also engraved by de Bry and published in 1590. In August 1587, a group of 112 English colonists, including two pregnant women, arrived at Roanoke Island, a spit of land located in what is now known as the Outer Banks of North Carolina, to found the second European colony on the east coast of the Americas (a previous colony in the same area failed). The new colony’s governor, John White, soon headed back to England to procure additional supplies for the settlers. He intended to return as soon as possible, but delayed in England by the country’s war with Spain, it took him three years to again land on the Carolina shores. 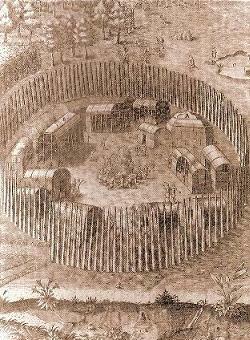 On Aug. 18, 1590, White finally arrived at Roanoke. What he found – or rather, what he didn’t find – has since evolved into one of the biggest mysteries in American history, a source of endless research, investigation and speculation that still flourishes today. When White got to Roanoke, all the English settlers were gone and the colony abandoned. The only clues White found were two etchings, including the now famous one on a post near the entry reading “CROATOAN.” In the ensuing decades, numerous exploration parties attempted to locate the missing settlers, but to no avail. They had vanished. Or did they? While the truth may never be completely known, numerous theories have been offered to explain the colonists’ disappearance. One holds that the English settlers were massacred by hostile Indian tribes in the area. Another posits that they were attacked by Spanish raiders. “Everyone in the world has their own opinion about what happened to them,” notes Phil Evans, co-founder of the First Colony Foundation. “Their Manner of Fishynge [sic] in Virginia.” Engraving by Theodor de Bry after watercolors by John White. But perhaps the most compelling explanation, and one that is gradually gaining acceptance in the historical and anthropological communities, is that the colonists left their outpost to live with, and eventually assimilate into, local Native American communities, especially the nearby Croatoans. “It’s not unreasonable to think that some of the lost colonists could have been adopted by Native Americans, who often did accept (outsiders),” says Dr. Stanley Knick, director of the Native American Resource Center at the University of North Carolina – Pembroke. 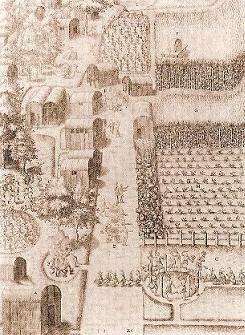 When John White returned to Fort Raleigh (another name given the Roanoke Colony, as it was financed by Sir Walter Raleigh) in 1590, he found no evidence that the colonists had been forced out, killed or otherwise placed in any danger. As a result, he believed that the etched word CROATOAN referred to a local Native American region, and that the colonists were now living with the tribe based there. White’s belief was underpinned by the fact that during a previous failed colonization attempt, English settlers were befriended by the welcoming Croatoan Indians and their leader, Manteo, who eventually became the namesake of a town on Roanoke Island. At least one subsequent English explorer of the region, John Lawson, wrote in 1700 of discovering Native Americans who spoke English and read from books. They also described people with striking European features, including, most noticeably, gray eyes. 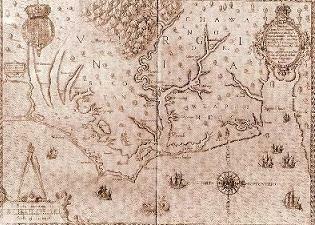 “Our main hypothesis is that the Lost Colony moved into the mainland with the Croatoans and assimilated,” says Fred Willard, founder of the Lost Colony Center for Science and Research, an organization that has focused its research on the ancestry of modern Native Americans and their possible connection to the Roanoke colony. “We could be wrong, but I don’t think so.” The center began as the Croatoan Group in 1993 under the leadership of Willard and has used methods as varied as deed research, archaeological digs and satellite imaging. Willard says he believes the Lost Colonists assimilated into the local Native peoples, who were then forced onto the Carolina mainland by encroaching Europeans. He says the center has pinpointed roughly 5,000 living descendants of those displaced people. 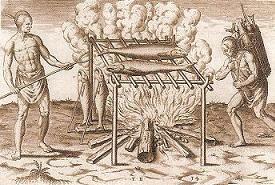 “How They Cook Their Fish.” Engraving by Theodor de Bry after watercolors by John White. 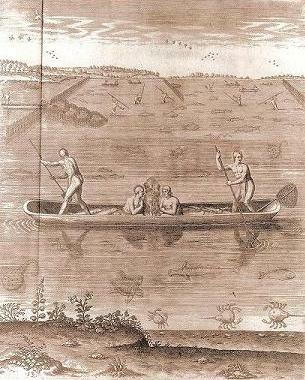 Proponents of the Lost Colony-Lumbee connection point to how Anglicized the tribe became. The Lumbee people have long spoken English and followed Protestant religious traditions. Nor did they undergo the forced migrations that other Native American tribes suffered through, because of their mixed-race status and because the tribe enacted early agreements with various governmental bodies to avoid displacement and the grossest forms of injustice. Today, the Lumbee people are one of the most prosperous and educated tribes in the United States, thanks largely to UNC-Pembroke, a university originally founded in 1887 as a school for the Lumbee. “Village of Secotan” Algonquian village on the Pamlico River estuary showing Native structures and agriculture. Engraving by Theodor de Bry after watercolors by John White. He’s not the only one who has doubts. Knick says that while many modern Lumbee believe they are descendants of the Lost Colony, perhaps just as many believe they aren’t. In fact, today’s Lumbee tribe seems to downplay the Lost Colony theory, because Anglicization is a double-edged sword. While it has brought education, relative prosperity and freedom from oppression, it has caused many observers – both Native and non-Native – to conclude that the Lumbee are too mixed to be considered Indians. “The Town of Pomeiock” Fortified Native village showing the manner of construction of the buildings and the enclosing stockade. Engraving by Theodor de Bry after watercolors by John White. Yet another theory, recently proposed by anthropologist Lee Miller, suggests the colony’s success was actually sabotaged by enemies of Sir Walter Raleigh, and that the colonists moved inland where the males were killed and the women and children were enslaved and eventually assimilated (see jhu.edu/*jhumag.1101web/Roanoke.html). In March, 2007, the British Museum will mount an exhibition entitled “A New World: England’s First View of America” showcasing 70 original, rarely-seen watercolors created by John White during expeditions to North Carolina in the 1580s. The same exhibition will have its inaugural showing in North Carolina at the North Carolina Museum of History, in Raleigh, in October 2007. Ryan Whirty is a freelance journalist who specializes in history, sports and music.